Every year the British Museum welcomes millions of people through its doors. And on social media they attract equally large crowds—nearly 4 million followers between their Facebook, Instagram, and Twitter handles. In this episode of our Hootcast podcast, the British Museum’s senior digital marketing manager Kate Carter tells us how they keep their millions of fans engaged on social media. Press play to hear the show in its entirety, or if you don’t have a set of earbuds handy, read the transcription of our conversation below. When you think of a museum you don’t immediately think of social media. 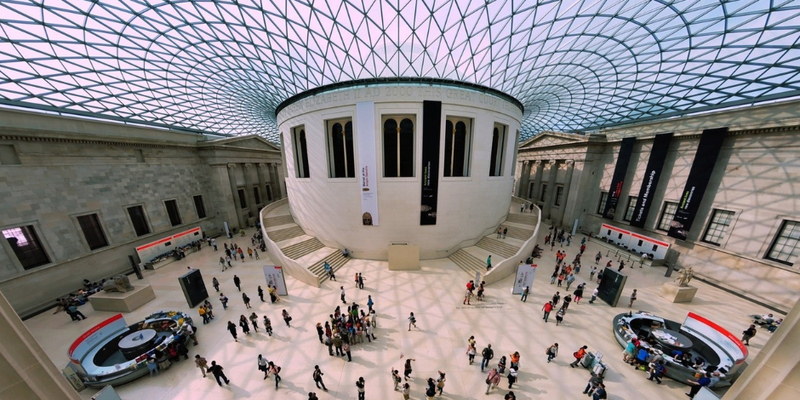 So, what is the British Museum’s mission and main goal on social media? It’s essentially interpreting the museum’s mission, which is we are a museum of the world, for the world. We have over two million years of human history brought together under one roof here in London, which includes some of the greatest cultural achievements of every culture that has ever existed across two million years. We’ve got over eight million objects, a repository of human achievement from across the world. And so, social is kind of the perfect space really for us to be trying to tell that story. The audience we have across Twitter and Instagram is in the millions. We hope that that will continue to grow. And it’s hugely international; it’s between 80 to 90 percent overseas. So, what we believe we’re doing with social is really fulfilling our mission, which is to bring this world collection to the world. How do you measure your success on social, what are your KPIs? It’s something we’re constantly re-evaluating. We started off with the usual metrics around how many followers we have and then trying to make that grow, which is still important. Increasingly, we’re looking at the number of interactions that we’re generating and the rate of engagement for different platforms. How fast is the growth, how engaged is a percentage of our followers with the content that we’re posting. We’re benchmarking more and more against our peers as well, so we compare ourselves not just against other museums in London or the U.K., but across the world. We look at who is doing that really well and make sure that we’re constantly trying to be up there amongst the best. So you’ve gone from measuring social following to also looking at engagement and diving a little bit into competitor analysis as well. And also looking at our responsiveness, so the customer service part has become an increasingly important, too. We’re now looking at how many people have tweets, you know, when they have questions, how many of those are we replying to, how quickly are we replying, how much added value are we bringing to people by being able to respond to feedback or being able to answer those questions to be able to navigate our website etc. So, like you said, you’re a museum of the world, for the world, and your social following definitely reflects that. You have over a million followers on Twitter and Facebook and almost a million on Instagram. We were thinking you likely have two separate audiences, people who come into the museum and they follow you and are fans, and then people who are also fans who may never come and may want to learn about the history you share. How do you balance that experience on social? It’s really interesting that you define it like that because I guess the way I like to think about it is that everyone in the world is someone who has maybe visited the British Museum once in their lives or potentially will one day visit. And maybe that visit becomes something that we can provide through a virtual reality experience. I don’t believe there’s anyone out there who might be choosing to follow us or engage with us on social who has no intention of ever stepping through our doors in some form. I like to think of it more as a continuous lifetime relationship that we have with people, that they’re either hoping one day to come or they’re physically here right now, they’re planning their visit onsite. We still get comments from people on Facebook saying I came to that exhibition in 1972 and I had the most amazing time and there’s a lot of nostalgia for that. It can be a really special visit for people. Yeah for sure. So even the people who may have not come yet you would still consider like an aspirational audience rather than defining that bucket as people who may never come. Exactly. Because that’s reading into the sentiment that we see in the comments on our content. People talk about how much they’d like to come or how much they loved coming in the past. And so, that’s really informed my way of thinking about that audience. And rather than putting them into a box of assuming that they’ll only have this relationship with us through interacting with our Facebook posts, I like to think that there could be potentially something more substantial that we can offer them. And like you said even offering like a virtual tour, that in and of itself is a form of visiting the museum. Do you find since you’ve really ramped up your social, that it’s been an important way for you to reach out to young people to discover the British Museum and learn about historical collections that they might not otherwise see? Absolutely, we obviously see the trends and audiences that are engaging with us on social that might be different to the ones that we’re picking up through other more traditional methods like surveys. And by channel there are big differences. So our Instagram audience is, you know, on average much younger than our Facebook audience, which doesn’t mean that we necessarily think about the content differently because we think about people more in terms of their areas of interest rather than grouping them by age. But certainly looking at the youngest end of the spectrum and thinking about how we engage kids and young people; we do a lot of programming around that. We have an amazing schools and families program. We have the Samsung Digital Discovery Centre in the museum, which has this incredible program of digital-based activities for young people. Increasingly, we’re looking at how we integrate social media into those experiences but also how we use social to better promote them as well. That’s something that a lot of brands can learn from. I think we get hyperfocused on targeting millennials or a certain age demographic and making assumptions about what they would want to see. So you’ve actually noticed through sharing content that you see a wide range of interest across age groups based on different types of content. Yeah, exactly. And you receive different audiences for exhibitions we might be putting on, for example a live broadcast we’re doing. You can bring together a community of people who might seem demographically quite diverse by those sort of traditional categories but have a really shared interest, something like history or art is something that does connect across those different segments. There are people here who are real history buffs, who read a lot in their spare time or people who are specialists working in the field, they can all have that shared interest even though they’re in kind of very different places in their lives. Do you have any channel-specific strategies or tips that you could share? I think we realized that by becoming more channel-specific, that in itself has made us more successful across the board. A couple of years ago we were in a situation where we were cross-posting a lot. We were thinking about what are we going to share on social media on Wednesday and would adapt that message, like we would edit the characters down to fit it on Twitter. We might think of the image differently for Instagram but essentially we were sharing the same kind of stuff. Now we plan totally differently. We plan every channel separately as well as thinking about what’s coming up this week, next week, next month etc. We’re also thinking about what does that trajectory look like on Facebook and on Instagram and we do different climatic series of content on the different channels and they really kind of standalone now in a way that I think has helped them all grow and become more engaging. You do a lot of cool stuff on Facebook and with Facebook Live as well, do you think you could tell us a little bit about that? Facebook Live has definitely become really important to our strategy. We’re trying to do a lot more live broadcasts. We find that they do something quite special that other video formats don’t do, which is that sense of bringing people together around a moment. And just for that kind of maybe half an hour or something that you’re broadcasting, you know, you manage to bring together thousands of people who are all over the world. We did a few live events recently where we had comments from people in over 90 countries, which is phenomenal to see. And what we always do is get people to tell us where they’re watching from so you can see comments flooding in from all these different cities and states and countries. I think the audience get a kick out of that as much as we do because it feels exciting to have that sense that somehow these people are collectively experiencing something even though they are in completely different environments. Would you say that one of your goals is to connect people from around the world, around one central experience or one learning experience? Yeah, I mean I don’t want to start sounding like we’re Facebook connecting every human on the planet. But yeah, I think there is something about that. And I guess for us it’s that we have such a range of experiences to offer, you know, the content, the collection, from contemporary art to ancient sculpture and everything in between. We feel like we are in this really privileged position of being able to offer this series of unique experiences that people can choose to come together and be a part of if they follow us and choose to tune in. What are some ways that you’re using Instagram? Do you do anything with the stories, is it just images? What are your strategies around that? Yeah I think we’d like to do more with Instagram stories, we’re definitely ramping it up. It’s sort of similar to that realization we had a couple of years ago around being more channel specific. I think that Instagram news feed and Instagram stories are two different channels. Now that we’ve separated them a bit more in our minds that’s really helped with loosening up and being a bit more creative with Instagram Stories. We try to use them to be a bit more playful, a bit more spontaneous. It changes things knowing that it’s only going to last 24 hours and that it’s ephemeral. Whereas, with our feed, there’s a lot more thought that goes into that in terms of the image selection and the length of information we share. We try and make sure that each post has a really quality story to tell and a visual that’s strong and enduring and that they sit together. We tend to post things in threes so that they have the sense of this automatic journeys, which is quite a considered approach I guess, whereas Instagram stories is, as I say, something that feels much more ephemeral. I really like the 360 virtual tour that you guys have on your Facebook. Would you mind dabbing a little bit more into that? Yeah, sure. This has been a collaborative pilot that we’ve done with Oculus. So, we’ve kind of worked with them directly and it’s you can say it’s on our Facebook page at the moment but it’s the first of its kind experience where you’ve got an interactive 360 virtual reality experience directly with a newsfeed. You don’t have to go outside of your newsfeed to experience it. So, it works if you’re using a Facebook app on your phone but if you want to go all the way into immersing yourself then you can put that phone into a Samsung Gear VR headset and then you feel like you’re walking around the galleries. We were really getting a kick out of trying it out. And I think it’s such a cool way to offer that experience to people who haven’t been to the British Museum or who would love to come but haven’t had that in-person experience. Yes. What was exciting for us about it is that VR still feels like something that a lot of people don’t have the devices yet and it still feels like people are in the early stages of exploring that. And what’s nice is this really puts it straight into people’s phones and puts the museum at your fingertips. We notice that you use long captions to describe a scene or provide a lot of context for what people are seeing. How does that fit into your digital strategy around storytelling or education or both? We are the custodians of this amazing collection and lots of the objects are visually stunning in their own right and maybe it would be enough to look at them. But with every object there’s a story behind it, there’s a reason why it has this particular status that it’s now part of the British Museum collection. For us it’s about bringing the people to life that are a part of the object’s story. So, who made it, who was it made for, who’s worn it, who’s used it, how is it used? How might that relate to something that’s happening today? And we try to kind of bring the objects to life with that human aspect. And that does require a few words to sort of tell that story. I can imagine too that providing that context for people also helps them to appreciate what they’re seeing more as well. I think so. I just personally I feel that it’s when the curators start describing an object to me that I get excited about it. That’s the stuff we want to capture in a bottle and share with our followers on social. Not everyone finds world history instantly accessible. If something is not really familiar to you in your culture it sometimes takes a little more of an explanation to relate to an object and kind of get inside the heads of the people that made it thousands of years ago. Yeah for sure. I mean I definitely have the same experience when I have a better understanding of what I’m seeing. I have so much more of an appreciation for what it is and where it’s come from. So how do you feature exhibits on social? What makes certain exhibits social media friendly or do you not divide out exhibitions that way or do you have certain ones that you choose? I think every object that’s in the collection has a story to tell and therefore has its place on social media. And over the years hopefully you’ll get around all eight million of them. Our selection criteria in terms of what are we posting now, is about trying to find balance. We’re always making sure that we’re being representative and sharing a range of objects that come from different parts of the world, different cultures, and different religions. We try to have a balance in terms of things that maybe were made or are about men and women, so the diversity of the collection is something that’s really important. It would be easy for us to default to sharing the things that we know are super popular. You know, we could look at our analytics on social and see okay, people love Egyptian stuff and we could just only talk about that and it would go really well. But it would be neglecting our duty to actually share some of the lesser known parts of the collection. And there are some amazing objects that are far less famous that have incredible stories to tell. Part of the job is unearthing some of those and bringing them into the spotlight as much as the ones that we know have huge appeal and that people want to see and we’ll always continue to share on a regular basis. In that way you are really important educators and using social to educate as well, not just get the highest engagement on every single post but also to inform your audience. Exactly. We want to take the audience on a bit of a journey with us. Something that’s really important to us is that sense that people trust the British Museum and that they trust us to take them to places that they might not have gone themselves. So, whether that’s a culture they’ve never heard of or an aspect of the past that might surprise them or the fact that the museum is continuingly making new acquisitions from around the world to carry on telling that story of humanity. And that’s one of our challenges as well as one of the real joys is trying to get that across, there’s so much to share. I think that’s something any business or brand can learn from the British Museum is that if you’re telling stories and you’re actually generating interest and educating and sharing things that are genuinely engaging then it resonates with people instead of just being talked at or told things to. Do you have any stories of a strategy or campaign that really worked well, something that you did that you saw a huge engagement or really good results from? Something that really worked really well for us was based on the Rugby World Cup and the Football World Cup. We did some really cool object pairings where every time a match was played we took an object from each of the countries that was playing and paired them up. So we’d have two different necklaces or two different helmets, something like that. And you can see visually the fact that these two countries have this kind of shared history, they have things in common, but also that they have distinct styles. That worked really well. People really responded to that and we got a lot of interest not just from the public but some of the football teams themselves. The official World Cup account shared one of our posts and some embassies around the world who were supporting their teams. And that was a really nice way of us bringing something into a much bigger conversation that perhaps no one else could do. I think that’s the tricky thing about getting a campaign right is working out what you can bring that’s unique—and sometimes the answer to the question is nothing and therefore you have to step away and let other people take the stage. That’s been a big learning for us as well is trying to figure out what we can bring that will add something really special as opposed to just jumping on the bandwagon for the sake of it. Yeah, I think that’s really good advice for brands out there to make sure that any campaign that you build is relevant and that, as you said, you are adding unique value to people’s experience. Thank you so much for joining us today. You’ve given us so many good insights.